(LWI) - “We are not used to fetching water from a borehole,” says 25-year old Sara Tarakila. With many others, she is waiting at one of the boreholes in the Nyumanzi refugee settlement in Adjumani district, northern Uganda. Together with thousands of South Sudanese she was forced to flee to Uganda after fighting erupted on 15 December, 2013, in Juba. “We are very happy to be here in safety in Uganda, and it is good that we can now get enough water. Before we were struggling,“ says Tarakila. The borehole at the Nyumanzi refugee settlement has been reconstructed by The Lutheran World Federation (LWF). “There was not enough water, but now things are improving here,” Tarakila adds, smiling. 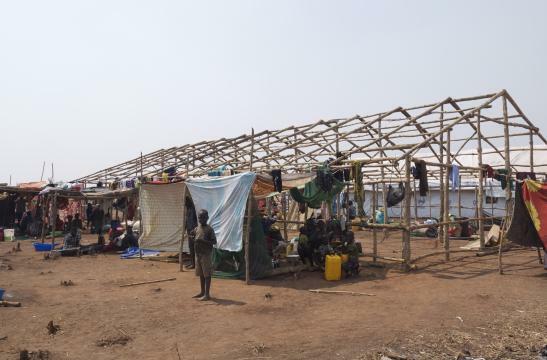 It is estimated that more than 59,000 refugees from South Sudan have arrived in neighboring Uganda through different border points, and are now in Adjumani, Arua and Kiryandongo districts. The United Nations High Commissioner for Refugees (UNHCR) reports severe shortages of water, sanitation and health provision, as well as in resources aimed at protecting the refugees, saying more funds are urgently needed. LWF was among the first to arrive in Adjumani, providing refugees with basic items such as plastic cups, plates, water cans and soap. Through its Department for World Service (DWS) program in Uganda, the LWF has rebuilt four boreholes in Nyumanzi settlement, and the drilling of six new boreholes is underway; three of which will directly benefit refugees in the settlement, and one for use by the host community. “This is important in order to ensure peaceful co-existence between the refugees and the host community,” says James Drichi, who is in charge of water, sanitation and hygiene (WASH) services for the LWF. Thirty-year-old Aurelia Mesiku comes from Ige village, which is located near the Nyumanzi settlement, where more than 43,000 refugees from South Sudan are currently residing. It is afternoon and dust hangs in the air. There has been no rain for months and Mesiku joins the many women from the local community who are also waiting to fetch water from a borehole in the settlement. But she can empathize with the situation of the South Sudanese. “I was a refugee and went from Uganda to Sudan when I was just 13-years-old. I am happy that we can also welcome the South Sudanese here,” Mesiku adds. However, the water situation at the Nyumanzi refugee settlement remains critical. “The situation is improving, but we are not yet there at all. We still need to construct at least 90 boreholes, as well as latrines and bathing shelters, and, as Nyumanzi gets full, we need to also construct and rehabilitate the new settlements,” says Arnold Kasoba, UNHCR WASH officer in Adjumani. The crisis in South Sudan has displaced hundreds of thousands and created a refugee influx in neighboring Ethiopia, Kenya and Uganda. The LWF is scaling up its humanitarian work to meet the needs of South Sudanese fleeing the ongoing violence.